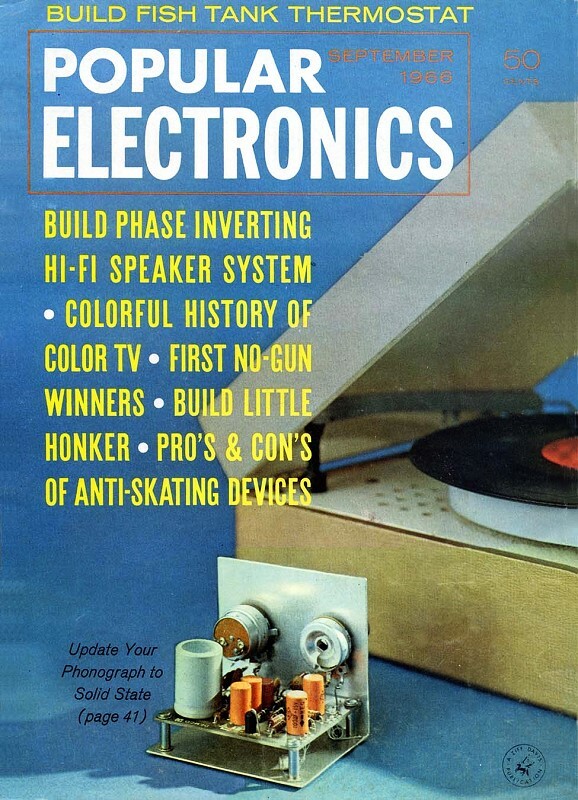 The July 1966 issue of Popular Electronics began a series of anecdotal instances of stupid and/or funny remarks made by people about electronics. Some are supposedly by those who are in the trade and should know better. I have to take issue with and question the veracity of one instances in this first sequel, which claims a technician coming out of military service are apt to make statements such as fuses being bad because they are "shorted." It must have been submitted by an anti-military hippie of the era, because there's no way anything other than a vanishingly small minority of techs who have spent two to four years or more years servicing real electronic equipment would say that. If you judge the success of a contest by number of entries received, the "No Gun" contest (Popular electronics, July, 1966, page 38) is a resounding one. Hundreds of letters and postcards have poured in with nonsensical remarks about electronics. Choosing winners has been a difficult task; and with so many good stores to tell, we have decided to continue the contest for a few months more. Listed below are the winners of soldering guns for this month. This month's "classic" was submitted by Larry Brown, who claims that, while checking electronics repair work by repairmen fresh out of military schools, he heard on several occasions, "Hey! I found what's wrong with this set - the fuse is shorted!" Stories about TV installation and servicing constituted about half of the "No Gun" contest entries. Although many were duplications, and some as old as TV itself, a few of the better stories bear repeating - especially the "old saw" about the newly installed TV receiver whose owner complained that the TV picture was better in the store. To which the TV installer/repairman replied (as he rolled the picture with the vertical hold control), "Lady, stop me when you see the best picture." And then there's the story of the old-timer who, when paying his monthly TV cable fee (CATV), loftily informed one of the engineers, "My first radio set was a 6-tube Neutrodyne - we didn't have electrons in those days." The best place to overhear colorful, but inane, comments on electronics is at a radio parts store. Some of the questions asked, and many of the answers given, are priceless gems. One salesman reported that he had given up truthful answers to questions about battery life in transistor radios and now, with a straight face, he solemnly states that the batteries will last 2 months, 4 days, and 7 hours. A satisfying answer to most people. At Harvey Radio in New York City a woman customer reportedly asked the clerk for a "six by five" radio tube (to which the clerk probably replied "inches or feet?"). But not all "funny" remarks are made by customers - one clerk in a Newark, N.J., store, when asked for a 2-watt, 750-ohm resistor, returned to the counter with two 1-watt, 750-ohm resistors, saying that the two resistors needed only to be put in parallel to make up the wattage rating. Hams and CB'ers were overheard making scores of implausible remarks. In number of entries, hams and CB'er came out about equal, though the CB'ers were many times as "funny." Probably the funniest remark made by a CB'er was in a Waterloo, Iowa electronics supply house. The CB'er was returning a 60' length of RG-8/U 52-ohm coax cable. In addressing the clerk, the CB'er complained, "I measured the value of this cable with my VOM and it's nowhere near 50 ohms. It's an open circuit. I want some 52-ohm cable that works."